Firstly, I have to start by thanking the fantastic @SteveBunce for this idea. He shared it a couple of year's ago when I saw him at Animate to Educate's Tech on the Tyne conference. I am very much looking forward to presenting their again this year. So the idea here is that children take a song and break down the lyrics down into a flowchart. Using the repitition and patterns in songs, the children can start to consider the different symbols and links when creating a flow chart. Here we are decomposing, abstractin, writing an algorithms with patterns. It is finally here! Both myself and John Murray have been working very hard on the latest pack. We apologise that it has taken a little longer than hoped but we are so proud of this pack. 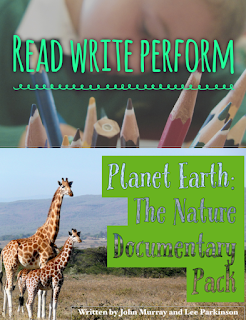 In this pack, the children read, deconstruct and then write their own information text about an animal which they perform by making their own nature documentary just like the legendary David Attenborough. In fact, an excerpt from one of David's fascinating documentaries is featured as a comparative text. The Unit of Work is aimed at Key Stage 2 & 3. The aim of our packs is to cover all elements of the English curriculum in an engaging and purposeful way using a variety of media. As mentioned in the video, for some tech-inspired World Book Day ideas, visit this link. I also mentioned the fantastic work done by @TheDistrictCE through their Year of Reading. Click here to read what they did month by month.